A Rhaetian house reconstructed on the original foundations at the Ganglegg. Near Schluderns, Vinschgau, in Italy. Photo by Sean Manning, May 2015. If you head up the valley of the stream which runs below Schloss Churburg, cross the river a short way past the wading pool which the Vinschgauers built for bathers who want enough water to get wet in in the summer drought or won’t dare the slippery stones of the streambed, and ascend the path which snakes up the right bank amidst jingling cowbells, you eventually reach an archaeological park on the mound called the Ganglegg. 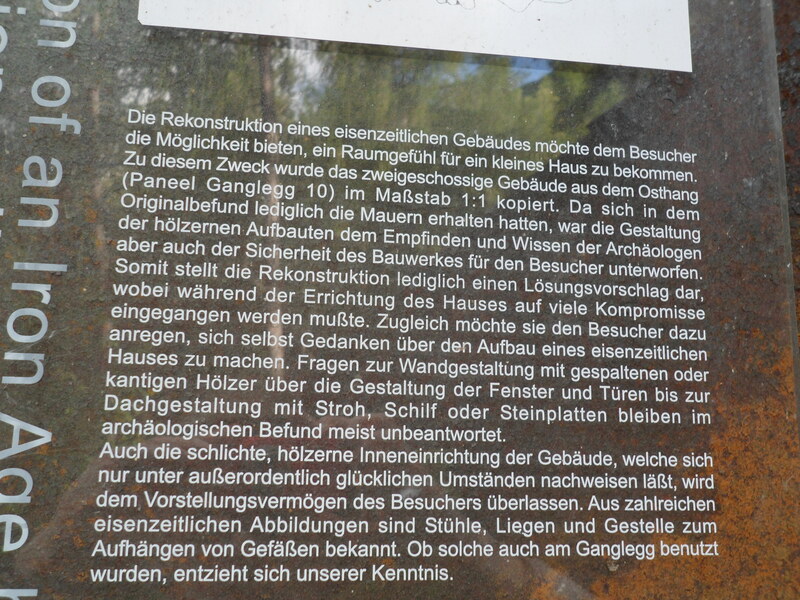 Aside from the uncovered foundations and picknick tables and aluminum signs, the designers of the park also decided to reconstruct a handful of buildings. But that decision was not without controversy amongst the archaeologists. 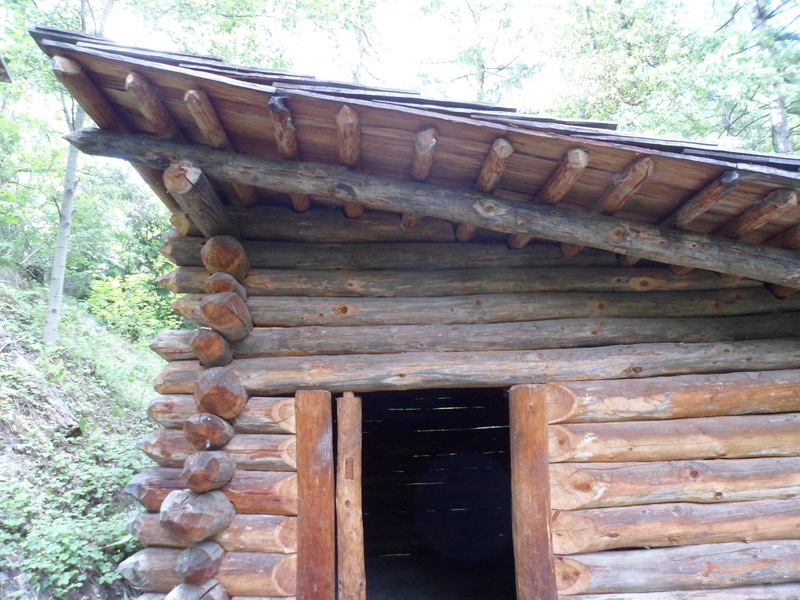 The reconstruction of an Iron Age building ought to give the visitor the opportunity to get a feeling for a small house. To this end a two-story building from the eastern annex (Paneel Ganglegg 10) was copied at a 1:1 scale. Since only the walls had been preserved archaeologically, the form of the wooden superstructures was influenced by the taste and education of the archaeologists, not to mention the safety of the construction for the visitor. As a result the reconstruction simply represents one possible solution, which was undertaken during the erection of the house amidst many compromises. It should at least arouse the visitor to consider the construction of an Iron Age house for himself. 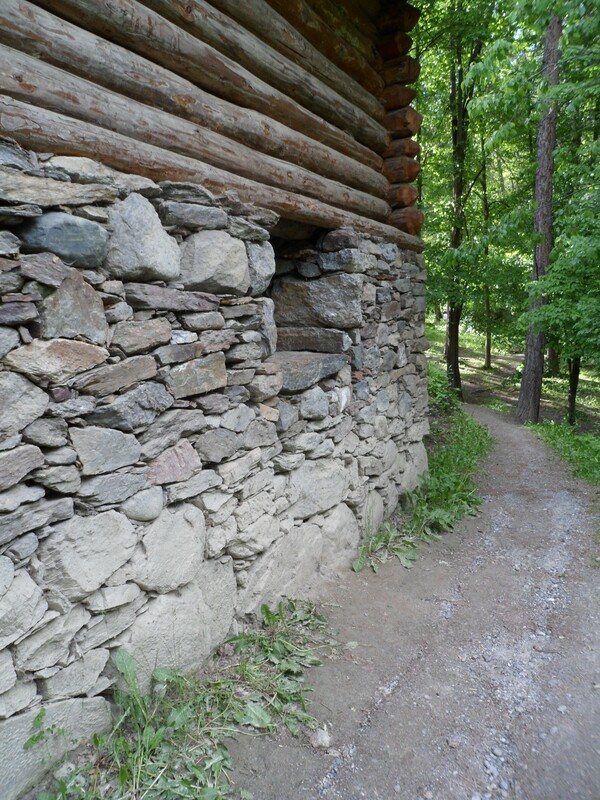 Questions about the construction of the walls with split or adzed timbers, about the form of the windows and doors, and about the covering of the roof with straw, reeds, or slate, remain unanswered by archaeology. Moreover the simple wooden furniture of the building, which can only be documented in exceptionally fortunate circumstances, is left to the visitor’s powers of imagination. Chairs, couches, and racks for hanging vessels are known from many Iron Age depictions. Whether such furniture was also used in the Ganglegg escapes our knowledge. The wooden superstructure which got the archaeologists so upset. Photo by Sean Manning, May 2015. This sounds like the archaeologists were debating their proper role: should they just talk about the evidence (an approach called positivism) or try to describe what the nature of the thing studied tells them must have existed in some form (an approach which to my knowledge does not have a name, but which is used by popular historians and serious historical novelists)? This is an issue which everyone who studies the ancient world has to face, but especially archaeologists. The intense archaeological investigation of the Mediterranean world has showed that that world was much bigger and older and more diverse than the remains of Greek and Roman and Jewish literature implied, while debates between archaeologists revealed that it was extremely hard to use these mountains of evidence to answer many simple and natural human questions such as “what people lived in this settlement?” or “how much of the wider world did they know?” I am glad that the excavators decided against positivism and showed how one of the buildings on the Ganglegg might have looked. 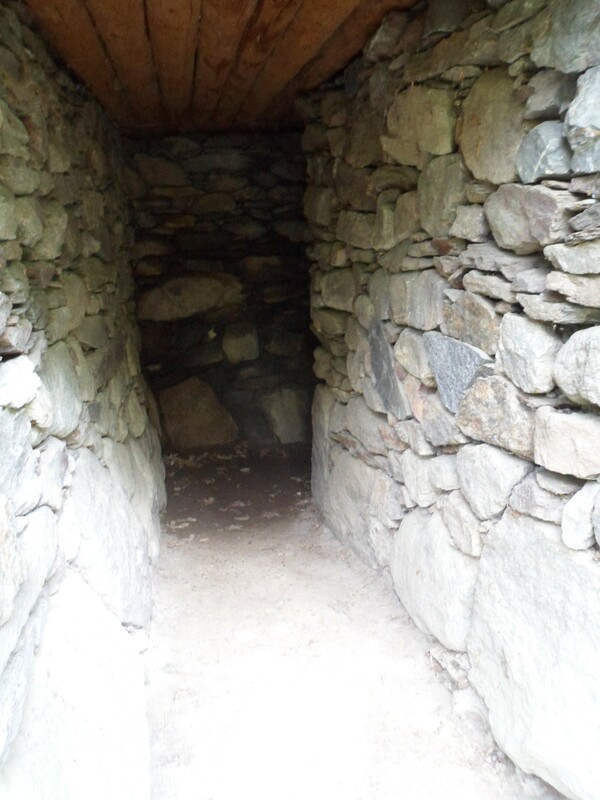 The entrance tunnel to the lower story of the reconstructed Iron Age settlement. Photo by Sean Manning, May 2015.